Homebuyers looking for the ease of a new home in Evesham, together with a choice of well-designed properties, have already bought over 80% of homes at Newland Homes’ Brooklands development. Situated on Cheltenham Road East, Brooklands is a development of 47 two, three and four bedroom homes. However, it is the four bedroom homes that have been surprising homebuyers the most, with many not aware of the opportunities available to help them secure a home larger than they initially expected. 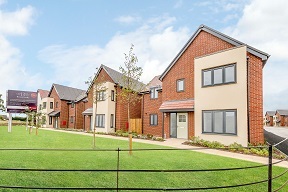 There are five different styles of four bedroom homes available at Brooklands and combined with the Government’s Help to Buy scheme, those wanting to move up the property ladder to a four-bedroom home could make the move by initially funding a total of £256,000, comprising a 5% deposit of £16,000 and 75% mortgage of £240,000. The remaining 20% is provided through an equity loan from the Government, which is interest free for the first five years. Help to Buy is available to all buyers who can provide a 5% deposit and who can obtain a capital repayment mortgage for the purchase of their main, and only, property. The Help to Buy scheme is available on all new build properties with a value of up to £600,000. Gail Remnant, Associate Sales Director at Newland Homes, said: “Our choice of four bedroom homes means that there is one to suit every buyer, so if you’re looking for ample bright and airy family spaces then the Hilmarton would be perfect. Our Prestbury home is a distinctive property boasting a lounge/study area with direct access onto the garden; the Hampton and the Thatcham are both three storey homes with master suite across the top floor, complete with en-suite and walk-in wardrobe; and the Hatherop has an impressive double height bay window and integral garage complete with a handy utility area. Brooklands is an outstanding development of 47 two, three and four-bedroom homes conveniently located for the main links in and out of the town. For more information about Brooklands, click here.